But what makes honey so popular? Most likely, it is the ease with which it can be consumed. One can eat it directly, put it on bread like a jam, mix it with juice or any drink instead of sugar, or mix it with warm water, lime juice, cinnamon and other herbs to make a medicine. It is savored by all due to its taste as well as health benefits, making it extremely useful and versatile. Its benefits include the following treatments, taken from both traditional and modern medical experts. Sweetener: It can be used as a substitute for sugar in many food and drinks. It contains about 69% glucose and fructose, enabling it to be used as a sweetener that is better for your overall health than normal white sugar. Weight Loss: Though it has more calories than sugar when honey is consumed with warm water, it helps in digesting the fat stored in your body. Similarly, honey with lemon juice or cinnamon help in reducing weight. Energy Source: According to the USDA, honey contains about 64 calories per tablespoon. Therefore, it is used by many people as a source of energy. On the other hand, one tablespoon of sugar will give you about 15 calories. Furthermore, the carbohydrates in it can be easily converted into glucose by even the most sensitive stomachs, since it is very easy for the body to digest this pure, natural substance. Improving Athletic Performance: Recent research has shown that honey is an excellent ergogenic aid and helps in boosting the performance of athletes. It is a great way to maintain blood sugar levels, muscle recuperation, and glycogen restoration after a workout, as well as regulating the amount of insulin in the body, as well as energy expenditure. Source of Vitamins and Minerals: It contains a variety of vitamins and minerals. The type of vitamins and minerals and their quantity depends on the type of flowers used for apiculture. Commonly, honey contains vitamin C, calcium and iron. If you check the vitamin and mineral content in regular sugar from any other source, you will find it to be completely absent or insignificant. Antibacterial and Antifungal Properties: It has anti-bacterial and anti-fungal properties, so it is often used as a natural antiseptic in traditional medicines. Antioxidants: It contains nutraceuticals, which are very effective for the removal of free radicals from the body. As a result, our body immunity is improved against many conditions, even potentially fatal ones like cancer or heart disease. Skin Care with Milk and Honey: Milk and honey are often served together, since both of these ingredients help in creating smooth, beautiful skin. Consuming this combination every morning is a common practice in many countries for this very reason. It speeds up the healing process by stimulating wound tissues. It helps in initiating the healing process in dormant wounds. It also helps in promoting moist wound healing. These healing powers are not overstated. The Waikato Honey Research Unit provides details about the world-wide research that is being carried out on the benefits of honey in medicine. Furthermore, BBC reported in July of 2006 that doctors at the Christie Hospital in Didsbury, Manchester are planning to use it for faster recovery of cancer patients after surgery. Such research will provide scientific evidence for the so-called “beliefs” held by honey lovers all over the world and will help in propagating the benefits to more people. Now that you know the benefits of honey, how do you eat it? You can eat it raw, add it to water or different beverages and you can also add it to several recipes. The benefits of honey that we get greatly depend on its quality. Not all of it is created equally, so quality is different, and subsequently, the various types do necessarily provide the same benefits. Type of flowers: According to the Honey Research Center at the University of Waikato, New Zealand, there is not enough evidence to draw conclusions on the properties of honey, especially the antimicrobial properties, based on the type of flowers used for its production. However, extensive research has been carried out on the honeydew variety obtained from the conifer forests in the central European mountains and the manuka variety obtained from New Zealand. The above mentioned honeydew kind has been found to have high microbial activity while manuka kind has been found to have high non-peroxide activity. Blending: It is also believed that polyfloral honey (which is obtained from more than one flower) provides more benefits than monofloral. Hence many companies sell blended honey as it offers the benefits from a variety and is therefore considered to be healthier than non-blended. Storage: When stored for a long duration, it becomes darker in color. It loses some of its properties and may also ferment if the water content is too high. Therefore, prolonged storage should be avoided, while newly harvested honey is almost always preferred. Heating: Heating honey leads to drastic changes in its chemical composition. As a result, heating to high temperatures reduces its benefits. It is no wonder many people prefer raw or organic or raw organic honey. While raw by definition signifies less processing (and no heating), organic honey is prepared using stringent organic production methods and processing standards, in which heating to high temperatures is not allowed. Water Content: Honey can also undergo fermentation. If the water content is high (above 19%), the chances of it becoming fermented are high. You can measure the water content using a refractometer. Furthermore, freely flowing honey either contains higher water content or has been heated to disturb the natural crystallization process, thereby reducing the benefits it will confer to you. Color: The color is a very useful tool to judge its quality. Light colored honey is more valued than dark colored as the former has a delicate flavor. It becomes darker upon storage and heating. Filtration: Most of the benefits are due to the presence of the pollen within the honey. Without the pollen, it is a glucose-fructose solution, and is just as bad for you as sugar. Unfortunately, companies market the transparent clear product as good quality, while in reality, ultra-filtered honey does not have many health benefits at all. That being said, you should be very cautious while consuming pollen-rich honey. If you have pollen allergy, avoid consuming it. Some people have the opinion that all honey available in the market is natural and obtained from the wild. Others feel that during its production carried out on chemically sprayed farms it cannot get contaminated with the pesticides sprayed on the crops and weeds. However, the truth is that the bees may also get affected by the extensive pesticide usage which goes on in the chemically treated farms. The issue is so severe that the Russian president, Vladimir Putin, warned Barack Obama in May 2013 that if the excessive control of pesticides is not reduced, it could lead to a globally volatile situation as the bee population throughout the world becomes more and more affected. If pesticides can kill the bees, how can they not affect the honey produced by these bees? Moreover, non-organic production involves extensive usage of antibiotics for disease control. It should also be noted that so far, there is no “scientific” proof that organic honey is healthier than non-organic. -In some cases, when the plants and weeds containing flowers have been sprayed with pesticides, the bees are poisoned with pesticides. -At times, the pesticide is sprayed on the bees directly. -In many cases, the bees collect nectar and pollen that has been contaminated with pesticides. -When pesticides are sprayed, part of the amount is accumulated in water on or near the plants. When the bees drink this water, they are also contaminated. -On some occasions, the pesticide gets sprayed on the bee hives or gets transported to it from the sprayed plants. Conventional the bees are given large doses of antibiotics to help protect them from diseases, but unfortunately, the honey also becomes contaminated with these antibiotics. In 2002, samples of Chinese honey were tested for the presence of antibiotics in Europe. Several samples were found to contain traces of antibiotics, which led to a ban on imports of Chinese honey in Europe. The ban was later removed in 2004 due to improvements in Chinese veterinary standards and imports of honey from China were resumed. What leads to this antibiotics contamination? 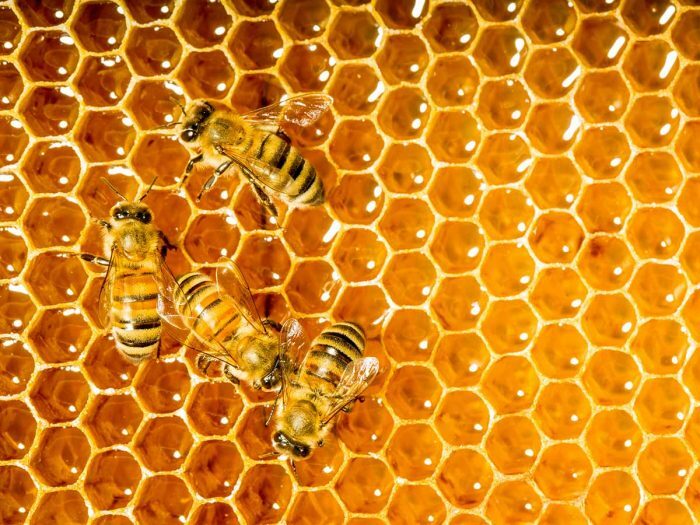 Unlike organic production, conventional honey production does not involve stringent guidelines for the quantity and mode of transmission of antibiotics to the bees. As a result, apiculturists have a free hand when using these antibiotics. When farmers use excessive quantities of antibiotics the chance of contamination increases. What is the problem with residues of antibiotics being found in honey? The antibiotics given to the bees are veterinary antibiotics such as chloramphenicol, streptomycin and sulfonamides. Large doses of chloramphenicol administered into the human beings may cause cancer and aplastic anemia. Similarly, high doses of streptomycin and sulfonamides are harmful to the human body. Many countries have not banned the usage of these harmful drugs in apiculture. The EU has banned all three while the US has thus far only banned chloramphenicol. You can buy raw honey at many grocery stores and health food stores. Local farmers markets are also great places to pick it up. Large big-box stores in the west, such as Walmart and Target, are also reliable places to find raw honey. Since it can be locally produced, you can also find this beneficial product at co-ops around the world. Where to buy local honey? Some of the best places to find raw honey are in the local neighborhoods near you. As a cottage industry that has gotten a major boost in recent years, local farmers markets and co-ops almost always have raw honey for sale. You can also go to larger stores and chains, which have seen the trend and gotten on board. Try everything from small health foods stores to major big-box brands, such as Target and Walmart. What does honey do for you? Honey does a number of things for the body, including strengthening the immune system, healing wounds and burns, preventing infections, soothing inflammation in the respiratory system, eliminating coughs and colds, balancing blood sugar and increasing athletic stamina. There are dozens of reasons why it has become such an important staple in our diet, due to the many minerals and nutrients it contains. The health benefits of honey are quite impressive, and since it is such a concentrated source of nutrients, it can be added to many different meals. Honey is able to monitor blood sugar levels, increase energy in a healthy and sustainable way, soothe inflammation throughout the body, protect heart health, and help to speed the healing process of wounds, and prevents infections. Honey contains a number of minerals and vitamins, including vitamin A, vitamin C, iron and calcium. There are also important antioxidants, such as flavonoids and alkaloids. There are also trace amounts of more than 15 amino acids found in honey! Some of the best places to buy honey are local farmers markets, grocery stores and medical stores. Many people make their own honey, and it can help your allergies if you eat honey that contains some of the pollen from where you live. It can help your system become accustomed and not react as quickly! Is pure honey good for you? Yes, pure honey is very good for you. Although it is high in sugar, there are also numerous antioxidants and organic compounds that make it well worth consuming. Also, pure honey is unprocessed, which you won’t find in many of the major labels and brands of honey. Locally produced honey, otherwise known as raw honey, is the healthiest type of honey you could possibly buy. Is organic honey good for you? 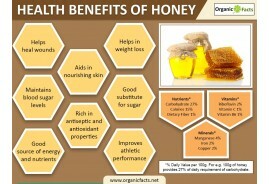 Organic honey is indeed good for health. It is unprocessed, so it retains all of the minerals and antioxidants, which is what you want. If you process honey, very often you’re only left with sugar, which is arguably the worst part of honey! Honey is considered organic when it is locally grown and not processes. Organic honey is also known as “raw” honey, cannot contain any pesticides or environmental pollutants. Since it does not go through the traditional process for safety, these standards must be upheld for honey to be considered organic. Also, non-organic sugars, antibiotics or honey cannot be used at any point in “organic honey”.